BLOCKCHAIN & CRYPTOCURRENCIES: WHAT ARE THEY AND WHAT IS THEIR POTENTIAL FOR THE UNITED NATIONS? CORE DIPLOMATIC TRAINING 2018, A COLLABORATION BETWEEN OICT AND UNITAR. 11 APRIL 2018 (10:30 A.M - 1:00 P.M.) UN SECRETARIAT, CONFERENCE ROOM 11. This event will provide an introduction to Blockchain technology for individuals without a technical background. It will feature an introduction to the technology as well as examples of its uses in domains related to the work of Governments and the United Nations. Featuring speakers from the private-sector, international organizations, academia and civil-society, this event will include demonstrations and will showcase projects in the humanitarian field. This session will provide an introduction for non-technical people about Distributed Ledger Technology, also commonly known as Blockchain. It will describe how this technology is used for a variety of purposes including cryptocurrencies, such as Bitcoin and Ether, by Ms. Ariana Fowler, ConsenSys. This session will present various initiatives using Blockchain in the humanitarian and development sectors. These initiatives are being carried out by public and private sector entities in collaboration with United Nations actors. Blockchain at the World Food Programme, by Mr. Robert OPP, WFP Innovation Accelerator. Children Identification for Trafficking Prevention using Blockchain, by Mr. Jorge Martinez-Navarrete, UN-OICT, Mr. Yoshiyuki Yamamoto, UNOPS, and Ms. Mariana Dahan, World Identity Network. UN Women Blockchain Lab, by Ms. Caroline Rusten and Ms. Arpita Varghese, UN Women. Blockchain at UNICEF, by Ms. Sunita Grote and Ms. Cecilia Chapiro, UNICEF Innovation. 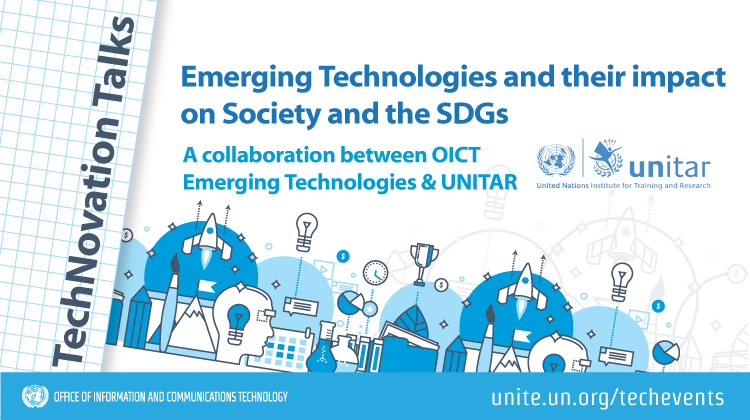 OICT organizes this ongoing series of conversations to raise knowledge among UN personnel, Civil Society and Member States on innovative ways in which technology can be applied to Sustainable Development.